With the digital world going crazy over the number of apps that are being launched every day, there are ideas that would but unique or in a unique environment. The applications developed are intended to solve a problem be it industry, individual, scenario or a market, however the success rate of the app are less than 10%, If you look closely the reason for such a low success rate could be factored to marketing the application and the app itself. For the consideration of this article, we would only look at from the development perspective on how the app could be made good and even great. To make a good app the app concept owner should keep following things in mind. User experience and user interface. The flow of the application is directly related on whether the application is directly focusing on the core concept with minimal distraction and without overwhelming the user. Lot of the new applications are developed having many features in them, while missing the KISS (Keep It Simple Stupid). The inherent nature of human is “Resistance to Change” so whether it is asking your customer to bank from the app rather going to Physical bank, or asking user to user to adapt an newer social networking platform than Facebook, it will take a doing. It becomes imperative that the new solution is easy to understand and hence easy to adapt. So working and designing the flow of the application is critical step. We at CDN Solutions, India, suggest all prospective clients to do and exercise where their flow is defined prior to signing development contract. Localization is also very important aspect while doing a flow, you could have one business running great in one country might not exist in other country or the way they do in different country is different to other. User Experience and User Interface, is commonly understood as the design layout. But is actually much more that. User experience should consider the 2Cs, Comfort and Clarity. The comforts in making user accept the app and Clarity in achieving the objective every time the app is used. This is an iterative process that needs to be done for test market of future users to get desired result. Keeping the above in mind will make your app good but to make it great, it is the smaller things which make a huge difference. 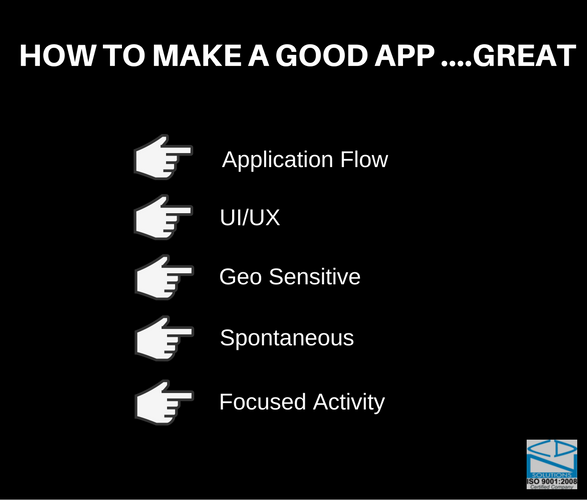 The great apps are apps which, I call are the “Alive apps”, these apps are designed in a way they feel alive, and these apps are proactive and per-emptive in its action. The one popular app and website that definitely falls in this category is Booking.com, The application is so wonderfully designed it feels alive, while searching it keeps telling how many are doing the same search, how many are viewing the same property, how may bookings were done in last 24 hrs and may such small statistical information is pushed to the user, which makes him fell in true sense the user activity and acceptance of the solution. Another great example is book my show application, when you book a ticket it shows a vehicle depending the no of tickets you book, like a bike is displayed if 2 tickets are booked and a car is shown when 4 tickets are booked. Also to give user better experience the no ticket to be bought is also a selection rather than entry box. Another example in the same direction is making use of local database of phone for apps which do not have too much dynamic data, looking at this closely while designing would mean you could have a trade of speed of using the app against speed of loading the application, both would work but you need to decide which would add to better experience of the user. It is imperative the finer things should be looked at minutely so as to aim at customer delight and not just aim at customer satisfaction; this is where an app development company differs from and experience app Development Company. We at CDN are doing app development for last 10 years in 32 countries, visit here to know more about us. This year we are also exhibiting in CeBIT India 2016 for the 3rd consecutive time. You can meet us at our stand A103b in Bangalore International Exhibition Centre (BIEC), Bangalore, Karnataka, India. To know more about free tickets and our agenda for CeBIT India, feel free to contact us here.